Another food hot spot, is Quincy Market, situated next door to Faneuil Hall - along the Freedom trail. This is the place for the serious foodie. You can, literally, eat yourself through the American, European, Mideastern and Asian cuisine just by walking down the long hall. Sadly, you have to say stop quite early, if you do not show any restraint and seriously consider what you would eat today. 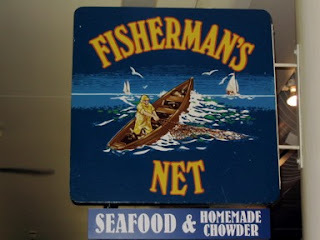 A homemade New England Chowder from Fisherman's net, often served in a bread bowl, is not the worst choice. Or a lobster roll? Tough!